I love visiting art galleries. Sunday afternoons were made for wandering around the Fitzwilliam Museum in Cambridge, getting to know each room and each painting individually. Recently, however, I’ve found myself wondering about the way galleries can take art out of their intended context, and the effect this has on our interpretation. Some of the paintings that hang on the walls of the Fitzwilliam, for example, were originally intended for an ecclesiastical setting, or were perhaps created for a specific family home. When dealing with art from hundreds of years ago, this is hardly an issue since it is unlikely that their original contexts still exist. But what about modern art? Over Easter, I visited the Henry Moore exhibition at Leeds Art Gallery. The exhibition as a whole was fantastic, but when I discovered that Moore had intended for one of his elm sculptures in the exhibition to be displayed outdoors, I couldn’t help but be disappointed. I am sure I would have appreciated it much more if it had been in the hilly setting he envisaged for it. I am yet to visit the Yorkshire Sculpture Park, which has a large collection of Moore’s work, but I imagine seeing his sculptures in their intended setting will give them a new meaning. After all, he often spoke of the way that hilly landscapes could compliment the natural curves and complexities of the human body, a subject he obsessed over in his ‘reclining figure’ sculptures. Admittedly, galleries make art more accessible. We can see multiple works in one location, often for free, and there are people on hand to talk to us and to aid our understanding of the pieces. But there seems to be a risk of art becoming something ‘touristy’. Visiting galleries becomes something we might do on a city break, making art distanced and abstracted from our everyday lives. Indeed some people have never even entered an art gallery, having decided that it isn’t their ‘thing’. Perhaps art is actually more accessible when it is in a more natural environment. This doesn’t have to mean within nature, but simply somewhere which allows art to be encountered in our day-to-day lives. Think of the graffiti artists who paint the city streets. Banksy, for example, may be controversial but his art has had a huge impact. 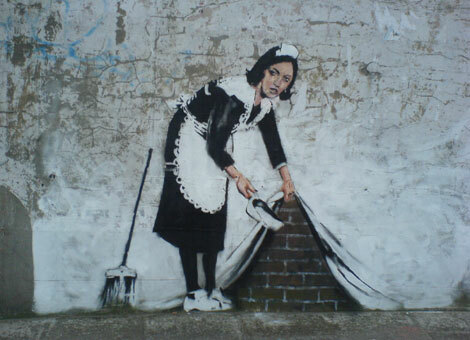 Simply by being located in city streets, Bansky has cultivated a huge audience. Although perceptions of his art are inevitably coloured by questions of legality, it’s possible that his art is more likely to be considered in relation to the life of the viewer than pieces hanging in galleries.